This is an ongoing series of Ghosts that I tend to do on an as and when I’m in the right areas to do them and can find where they were taken. The difficulty being the extend of the damage to the front and the 100 years mean sometimes it’s difficult to place anything at all, muddy fields being muddy fields. 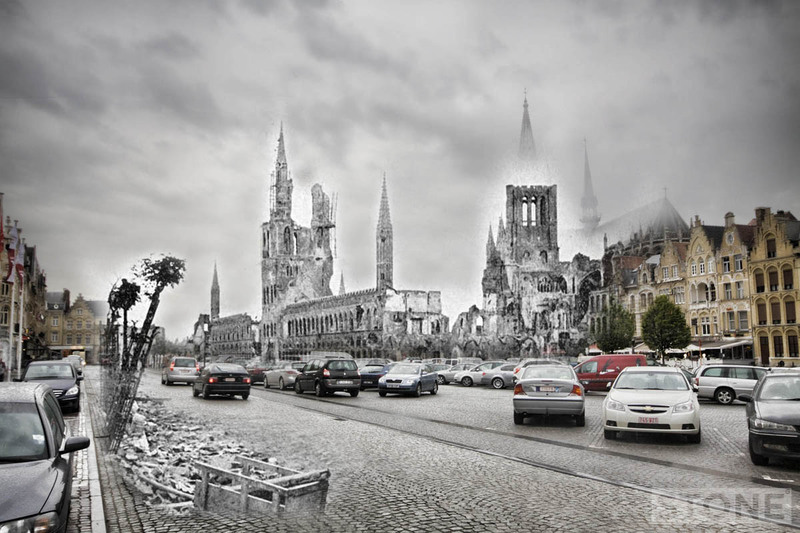 A lot easier in places like Ypres. 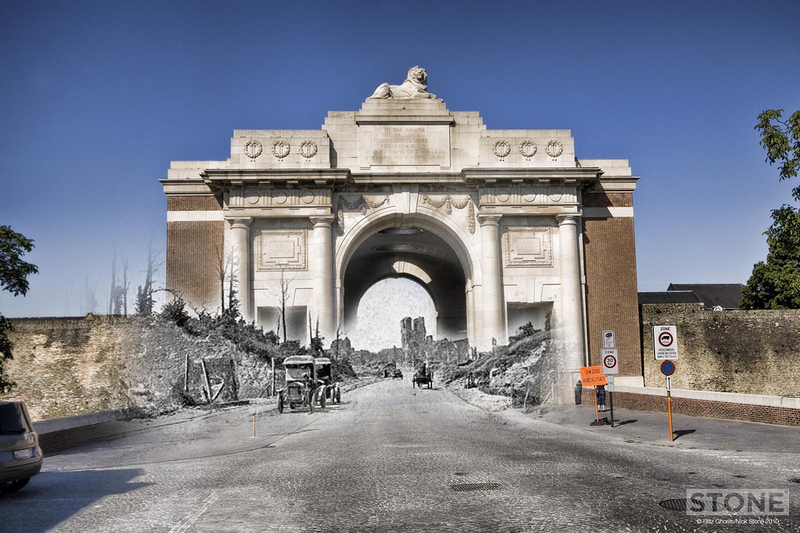 The earliest date from 1915 which are the Lakenhalle on fire the last are of the Lakenhalle (Cloth Hall) and the Menin gate in 1919. being from Norwich we already had a link with this city before the Great War temporarily crushed the life out of it’s medieval structure. Norwich besieged the city in the 14th century during a trade war; a cloth war in fact and part of the delightful Despenser’s crusade, (who is also dishonourably mentioned here). More on that whole caboodle another time. Possibly 1919, but the Lakenhalle ruins, through the arch, look a bit too complete to me, so who knows. This is now the heart of the Great War industry, a place where hundreds of thousands of men, stamped out that last fag and tramped on out into the Salient, and as such, whatever Sassoon thought of it (he thought it was shite basically, and I suspect he would have probably used a similar word, but it may have rhymed a bit) it’s a fairly poignant reminder of all those men, one of whom may well be a great-uncle or great great grandfather, one of them is my Grandfather, just on the left. 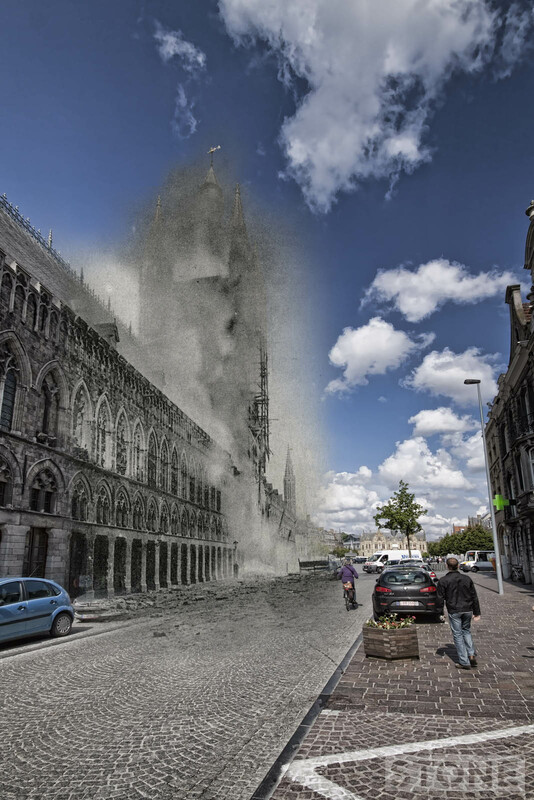 The 22nd of November 1914, Teh Lakenhalle burns and now-ish when it doesn’t, as well. Another one from a postcard I have, this one from 1914-1915, so not terribly specific, it’s an early one though as quite a bit of the Cloth Hall/Lakenhalle is still upright. Print is titled 1914-1915.. 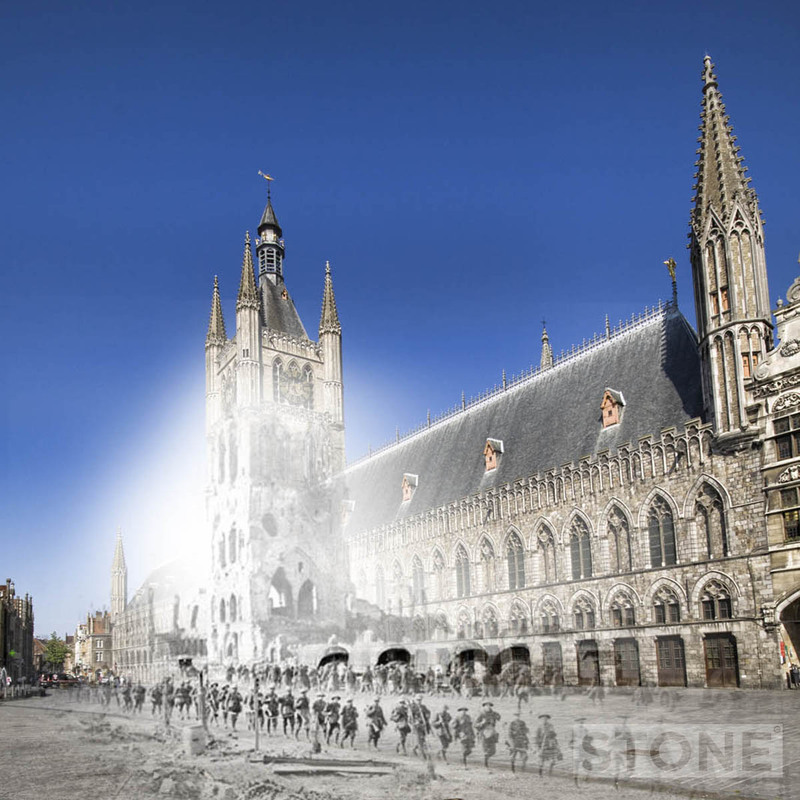 IN BELGIUM – YPRES belfrey at 4 o’clock in the afternoon December 21. Out of the rubble rises the tower, the original shots of a lot of these cards were taken after the conflict, during the clearup. This one probably dates from about 1919, they were sold in sets of 8 or 12 by the British soldiers who were unable to find a home or a country “fit for heroes” so they stood a the Menin Gate selling postcards and matchsticks. 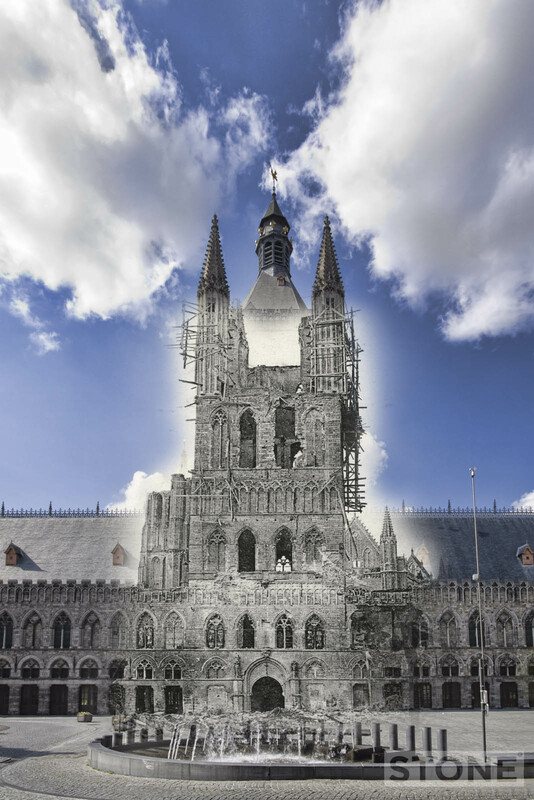 Some of the more able bodied were actually gainfully employed rebuilding the town of Ieper. 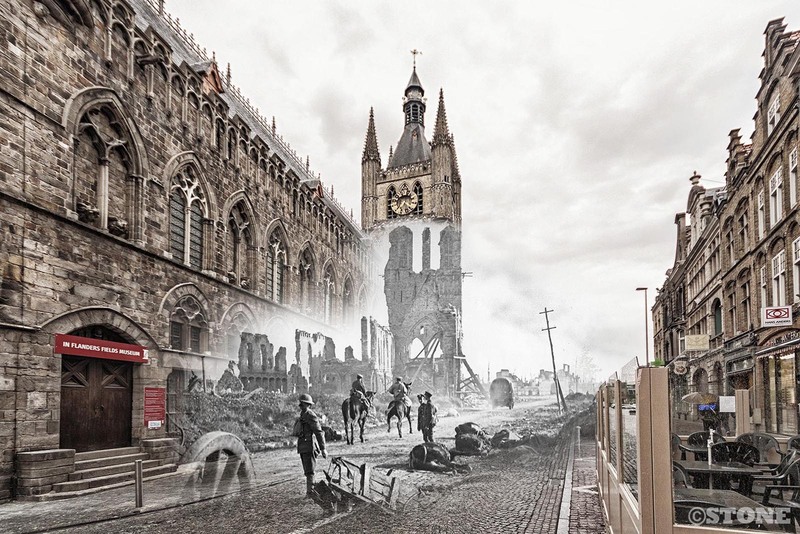 Your Great-Grandad or Great-great-Uncle could have marched past here in 1917 when it looked like this, on his way to possible death. We dawdled past here on our way to almost inevitable Westmalle Triple and Crepes. My how times change. I believe this is 1917 it appears to be dry, so I’m guessing before July, in 2011 it rained I got a bit wet, but I’m still alive unlike many of the men who headed out to the North East of here past the ruins. 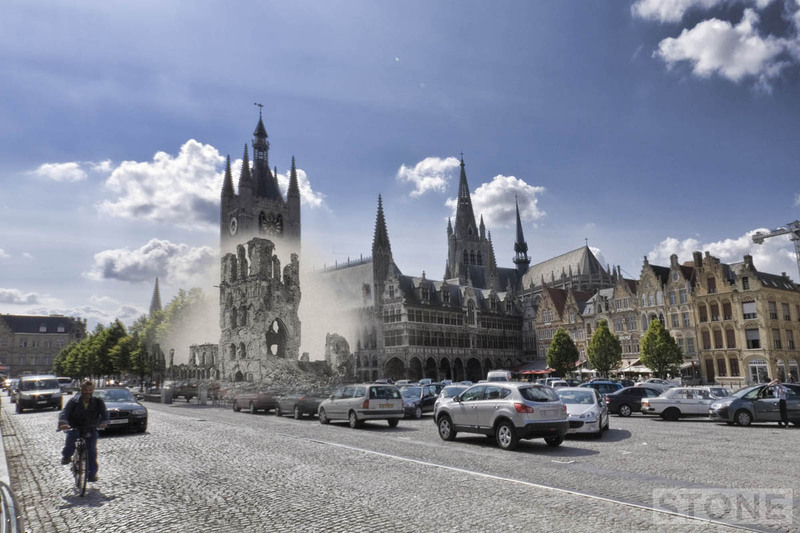 This is 1916 when it was Ypres or ‘Wipers’ and it isn’t because it’s Ieper in 2011, This is the Lakenhalle and Cathedral both how it looked and how it didn’t and does at the same time, I’m tying myself in a time knot.